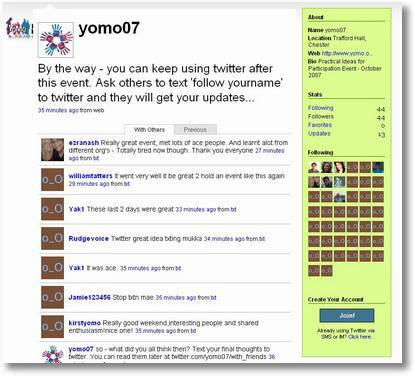 I've just returned from an event in Chester (YOMO's Practical Ideas for Participation gathering) where we were making use of a tool called twitter to collect and share instant feedback throughout the event direct from people's mobile phones. The image above shows the feedback we got at the end of the event, all sent in by text message. A quick account of how we used twitter and a creative commons briefing you can adapt for using twitter at your conferences. A reflection on the potential for twitter as a consultation/participation tool, and an invitation to suggest a pilot project. We set up a conference twitter account, and asked delegates to follow our account via mobile phone (by sending two sign-up text messages). Throughout the event we were able to send instant text messages to all delegates – letting them know about what was coming up next, and inviting feedback. And delegates were able to text in their reflections, questions and feedback – with their views instantly appearing on the 'twitter wall' projected up on the main room, and on tickers running along the top of each powerpoint presentation being given. It cost us nothing to set up. And it provided some really insightful gut-reaction instant feedback throughout the event. 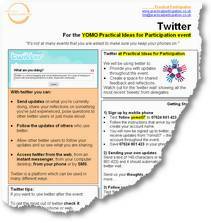 The briefing paper I used to get people started using twitter at the event is attached at the bottom of this post. It's not quite the same as the rest of the 'One pager…' series, as you will need to adapt this to your context if you want to use it. You will find comments in the margins giving you information on what you need to get set up for that. People opt to follow your updates via the web, their mobile phone, or an instant messenger (gtalk). Your followers receive your update on the web, by instant message or by text. They can reply to you by instant message, web or text message either public ally, or privately. You can read all the responses by phone, on the web or by instant message. It doesn't cost anything more than the standard cost of any text messages involved. If you are asking for public replies, then it would be possible to share the question and replies with others by pointing them to your twitter page on the web. Some twitter users treat it as a way of keeping in touch with a geographically dispersed team. Some twitter users micro-blog using it to alert others to what they are up to. People opt to follow your updates via the web, their mobile phone, or an instant messenger (gtalk) – you ask young people across the community to follow your updates by phone, building up a large groups of 250 'followers' across the community. You write an update – when you need to gauge ideas in the area on a particular issue. You pose a short question. Your followers receive your update on the web, by instant message or by text – hopefully as many as possible receive the message by text soon after you send it. They can reply to you by instant message, web or text message either public ally, or privately – you ask for public replies and within an hour you have short text feedback and ideas from 90 young people. You send a text an hour later thanking everyone from feedback and letting them know you no longer need replies. If you are asking for public replies, then it would be possible to share the question and replies with others by pointing them to your twitter page on the web – you could send a link to the views to a local councilor to ask them to read young peoples views directly. I'm not aware of any groups making use of twitter in this way yet (though I would be suspired if there aren't some out there applying it like this – do get in touch) and I would be very interested in supporting a pilot project. This blog post from Beth Kanter on twitter and Beth's other writings on twitter. 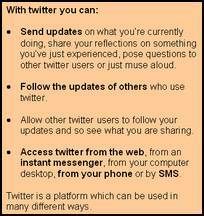 The twitter fan wink – that looks at many of the different tools that twitter fans have built to access, use and 'mash-up' information flowing through the service. That is really great and just what I need on a Friday afternoon (Yes … inspiring, No … i’m not going to be able to get work out of my mind all weekend!). Loads of scope for events and particpation. Yo Tim – well done for posting this! I take part in conferences in other places, thanks to twitter (especially useful if live streaming is taking place! I can tweet friends attending to pose questions). Let’s hope that soon we get some decent adoption of twitter here in the UK! Well done! Tim, great, useful post. Thanks for taking time to put it together and to share the story on the Twitter Wiki! Hi Tim – you got this up quick!! Firstly a note to say thanks for the brilliantly efficient way you got this set up and managed it for us. I haven’t yet had chance to read all the comments but I think the uptake of it was far better than we’d hoped and it definitely added value to the 2 days. Also I love how it turns the ‘please turn your phones off’ thing completely on its head into something that instead is positive – this alone I think is very attractive to people. You’re on a fast learning journey – very useful post. Thanks for writing about it and keep it the great work! Excellent post on twitter Tim. I will be interested to hear how your youth engage with it. My students see me use Twitter but they think it is totally freaky. Interesting …I was in Facebook before most of them…finally they are in Facebook. Wonder if it will follow the same path. The issue they had was they felt it was weird for me to talk to people online that I did not know. Wonder how they will find it compared to a SMS service. I love Twitter. I have often found at conferences, unless people are directly involved, they just don’t get it. So, the more we do this sort of thing, the better. I’m flairandsquare on twitter. Also, often, people don’t understand why personal and, to them, ‘non-relevant’ messages come through in the middle of a demo, like “having breakfast, sick of the rain… bored”. I think it’s so important to acknowledge that learners are choosing spaces they they can ‘live’ in and personalise and this is one of those spaces. So are blogs. Thanks Tim – I’ve been using Twitter for ages, and I’ve even seen it used for updates of other e-Learning events, but for some reason this post has given me the inspiration to set up a twitter account for edayz (www.edayz.org). I’m planning on starting it soon – that way I can get input from people during the planning stages…. Great website. I’m trying to find the Twitter briefing for conferences – draft.doc attachment for a feedback and evaluation session I’m holding but I can’t seem to find it anywhere and when I click on it, the page doesn’t display it. Is there any chance you could email me it or point me to the location? Although it may be a little out of date for UK use now that Twitter have shut down their SMS gateway. This definitely goes into my bag of markeing tricks. I would be interested in other marketing applications and case studies for Twitter. I used it at a conference for the first time last week and saw other people commenting on the same speaker content. I felt much more engaged and it spurred conversation afterwards with these people and others. Not sure how it looked to the speakers though! Next time I speak and I see someone fiddling with their mobile phone I’ll mention to the audience that maybe they are finding something useful in my speech to Twitter. More online is better even if they are somewhat distracted. Pingback: Twitter Araçlar?, Twitter Kaynaklar?, Twitter Yard?m? Next Next post: Free speech and media literacy for all?